While logged into your Tettra account, go to the top right dropdown, under your name. Select “Team settings”, and go to “Team Members”. 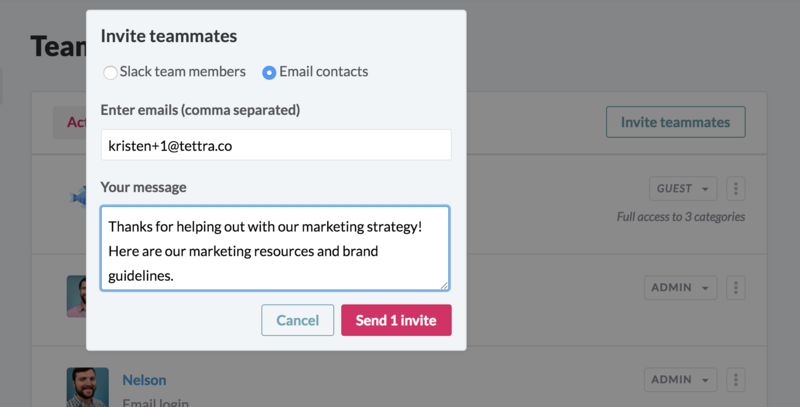 Add the person by email address or Slack user, just as you would any other team member. 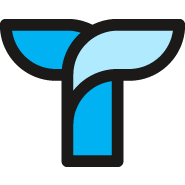 You can add a note if you want to give more explanation about why you're adding them and how you anticipate them using Tettra. Adjust their role to be “guest”. Once you've invited the person, you can adjust their access. Select the categories you want the person to access by clicking the 'Full access to ...' link below the role dropdown. Select as many categories as you want, and hit save. Once the person logs in and creates their account, they'll be able to see and edit pages in those categories. Guests can do all the same things that regular users can do, (including sharing and printing pages), provided they're in a category to which you've invited them. They can also see all information within public categories but will not be able to edit those pages, unless they are explicitly given access. They’ll also see all recent updates in the right sidebar, but limited to the categories to which you've given them access. You may add or remove a guest's access to categories at any time. You can change a guest's role (to a regular "user", for example,) if they move from a contractor to a full-time employee and need access to all categories. You can also deactivate their guest account. Both of these actions must be done by someone in an admin role. All user types (regardless of role) will be considered in your account's overall User count. Both Growing and Scaling plans include 5 free users. Check out our pricing page for more information.